It’s the 28th of February 1970 and women’s groups from around the country have assembled at Ruskin College, Oxford, for the first ever National Women’s Liberation Conference. A powerful, exuberant insight into the beginning of the Women’s Liberation Movement. Here at the Oxford University Union, women speak openly about their differing lives and aspirations. Some speak of increasing a father’s role in childcare and of improving child’s rights- ‘’in women’s liberation we are calling for the liberation of our children’ says one woman. Whilst others want to be acknowledged as women despite not wanting children- ‘must we regard women like myself, who have no desire to have a child, as freaks?’ The atmosphere is one of excitement and solidarity: a cacophony of slogan-painting and passionate debates. At the end of it all, the movement has four basic demands: Equal pay, equal education and job opportunities, free contraception and abortion on demand and free 24hr nurseries. ‘Keep Young and beautiful! It’s your duty to be beautiful’ is the ironic cry of the 4000 strong crowd of women singing and dancing their way through Oxford street, London in 1971. It’s the First International Women’s Day march and the movement’s four demands, emblazoned on banners, will soon be handed to the prime minister in a written petition. ‘I’m amazed by the amount of people here’ says one elderly man ‘I think it’s great’. 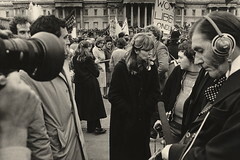 Whilst some women of a different generation view the march as an embarrassment – ‘do I think women are equal? Yes and no’ says one. The march gains widespread newspaper and television coverage, giving profile to the movement and a voice for its demands. It sparked off a series of laws giving equality to women and was seen by many as a landmark event. ‘I think it’s the beginning of the process of liberating everyone’ said one man at the time ‘the conflict isn’t really between men and women, men are pretty repressed too’. A powerful, exuberant insight into the beginning of the Women’s Liberation Movement, featuring notable feminists Audrey Battersby, Midge Mackenzie, Judith Brandt, Liz Danciger, Sally Fraser, Lyn Gambles, Esther Ronay, Kay Osborn, Michelene Victor and Sheila Allen. Embedding has been turned off, but you can watch the 26 minute documentary on YouTube. There is a descriptive transcript on Journeyman Pictures’ website. Ruskin College Oxford is currently organising a 40th Anniversary commemorative conference for 12-13 March 2010 with keynote speakers including Shelia Rowbotham, Gail Lewis, Bea Campbell, our own Catherine Redfern & Kristin Aune.There will be panel sessions, creative workshops and conference papers on a wide variety of topics. We’ll post more info later when it becomes available, but to receive the call for papers please email Dr Louise Livesey (llivesey@ruskin.ac.uk). Reading this, I thought “how inspiring”. Then I got to the bit about the four basic demands and felt utterly miserable that four decades on, we’re still not there. The comments on YouTube are really quite frightening, too (not the usual CiF “you have equality now so shut up” rubbish, but basic “arguments” against equality itself). At least it’s a reminder that now certainly isn’t the time to forget supposedly “past” battles. I watched this astonished – talking about the liberation of children? Talking about how feminism should also support mothers who wish to look after their children full time and not do paid work (but also not have to be economically reliant on a man)? Talking about the need for children to have a small number of constant, loving caregivers (basically, discussing attachment parenting) and how to reconcile this with feminism? In a word – neoliberalism happened. We are all economic units. Parenting has no economic output (in neoliberal terms) therefore is useless. Ruth, I agree that all the issues you highlight are important and still need to be talked about today. But I’m concerned your question “What happened, feminists?” seems to fall back on a caricature of modern feminists as women who devalue mothers or don’t wish to address their concerns. Perhaps I’m misreading the tone, but it seems to blame feminists for misunderstanding the nature of gender inequalities. As a feminist mother myself, I think this is deeply unfair, and I think we’re shooting ourselves in the foot if we focus on feminism itself as an adversary. The problem is negotiating a space between those who “value” mothers as long as they embrace economic dependancy and keep their mouths shut, and those who think women “have” equality and choice and blame any disadvantages on woman’s “choice” to opt out. The route towards redistributing “women’s work” and achieving economic liberation has indeed been horribly shoehorned to fit in with rampant capitalism, and it’s not been ideal for anyone. But I really don’t think most feminists are blind to, or indeed complicit in, this. Sorry Victoria, maybe I’m just more of a cynic than you. But I don’t think it’s a “caricature” when there is a huge problem with child-hate and mother blaming within so much of mainstream feminism. So much so that I stopped calling myself a “feminist mum” some time ago. @Ruth Moss I’m not sure it’s something I’ve noticed, I’ve got to say… but it’s likely I’m just not sensitised to it or noticing it because I’m not a mum. Just three blog posts off the very top of my head concerning three well-known feminist writers and their child-free cluelessness. There are many, many more examples, all over the blogosphere. I have to say, as a mother, I have noticed it. And that’s before putting the prefix single before mother. How many articles have you seen on feminist websites and blogs regarding the Welfare Reform Bill? Yes, I’ve noticed it too. Hard not to, sometimes. I’m a feminist mum and have never denied the status. I remember one ‘woman’s right to choose’ demo in the late 1970’s when there were hundreds of us marching up Oxford Street, with our babies on our backs, our toddlers in buggies and our older children skipping alongside with balloons, quite a carnival atmosphere. Then we reached the large branch of Mothercare, which was barricaded by huge numbers of police. They thought we would attack Mothercare because, obviously, we all hated children. It was funny at the time because it was obviously so clueless, but I do wonder if that attitude has really changed over the last thirty years. BTW, I’m now also a feminist grandmother… is that a different debate? I think this is scary because we’re having exactly the same debates today. It shows the problem then that still exists today with women gaining ‘equality’ – the same responses to it then. More than anything it pushes the idea how needed feminism is always going to be, and how a future movement has to be bigger and more forceful. Funnily enough having seen this documentary via a link on womensgrid and then saw at the 20th Anniversary Meeting of Women Against Fundamentalism a documentary about their (extremely brave) intervention during the Salman Rushdie affair in which women talked about being objectified, fundamentalism, etc., etc., it is extremely depressing to think we are still addressing the same issues. * but probably the most signifigant is that men didn’t really change!! Is there a reason why my comment wasn’t posted? I was really looking forward to a debate about feminism having wasted my time on the Guardian’s CiF blog, but then when I did submit something it hasn’t appeared. Does the F Word have a policy of only publishing the comments they like or what? @lost causes please see the message which pops up when you leave a comment, stating there may be a delay before comments are published. Sorry Jess if I appeared impatient. I actually couldn’t remeber when I posted it and on reflection it probably was sometime after the original article and comments. Claire I agree that a future movement has to be bigger, much bigger, after all half the population are female. Even if not all care to be activists, huge mumbers can do something. I’m not certain about that actual word forceful. Persistance might be more use. We can’t blame ourselves for the horror that was Thatcherism just because she’s said to be a woman – she was forceful and it seems to me that we feminists went a bit quiet from the late eighties onward, possibly from embarassment. Then in the 90’s media obsession with mocking political correctness turned feminism literally into the F word. Now there are more women in higher education than ever before, yet Woman’s Place is STILL below the glass ceiling, STILL tied to home-making, STILL struggling with under-paid employment. It isn’t progress and we all need the courage to persist! Don’t worry Lost Causes, Jess has a habit of snapping at people in this situation. Which is why I don’t post here any more. Yours was not an unreasonable question. Yet Jess, a supposed feminist, expects women to wait nicely like good girls and not ask where their comment is, even days later. It’s stated very clearly when you submit a comment that it may take a while before it is moderated. I’m not snapping at anyone, however the fact that comments must be approved before posting and we all have lives and commitments outside of the f word means this is inevitable. This is a wonderful film which captures the zeitgeist of inner discontent among women at the turn of the 70s; but before feminism helped to create a language to explain how we were feeling. So pleased the filmmaker and film will be at Ruskin next weekend. I don’t think it’s deliberate. I think the increased choices women have before them mean that more of them sort of inhabit these practically childless social circles than did in the 70s. Kids are more an abstract idea to them than a daily lived reality. Unfortunately, then they just repeatedly stick their feet in their mouths. So I understand why so many women of my acquaintance don’t have a lot of truck with “feminism.” Sure, some of it is just misunderstanding, but not all of it is on the part of the women rejecting the label!